This is a sale for a brand new genuine Honda Accord Prelude H22A H22Z F20B DOHC VTEC Reverse Idle Gear Component from Honda Motors, Japan. It will fit the aforementioned applications from 92-01 H22A-series, 99-01 H22Z-series & 98-02 F20B DOHC VTEC manual transmissions. It may fit other applications as well. Buyers please email us if uncertain of your application. 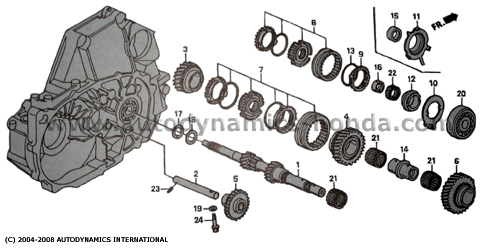 The reverse idle gear component is No.5 in the H22-series F20B DOHC VTEC hydraulic transmission mainshaft components diagram below.